Tropical clubnight Discolypso returns to Band on the Wall for a FREE party! 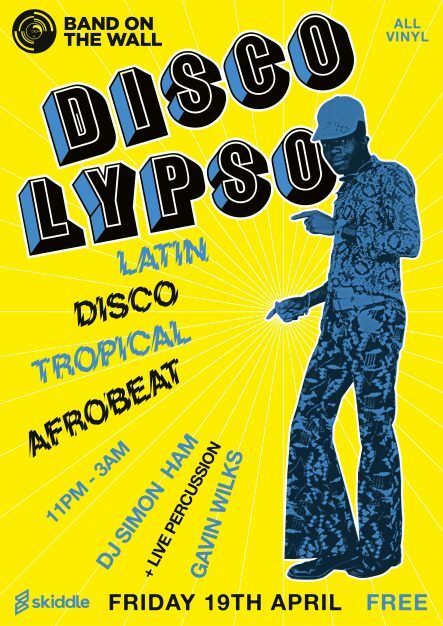 Discolypso captures the true essence of an authentic Caribbean dancefloor, fusing together Nigerian and Ghanaian Afrobeat with American Afro-Latin music and Caribbean Disco Boogie. Expect the finest uplifting afrosounds selected by Manchesters very own Simon “Fresh” Ham accompanied by the talented Mr Gavin Wilks on live percussion. You won’t hear a soundtrack like this anywhere else in town – guaranteed!